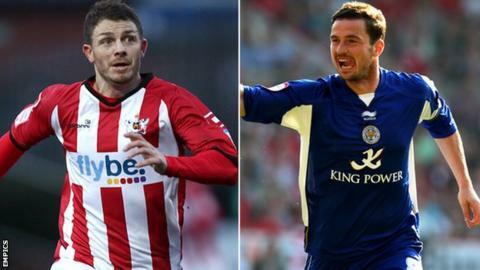 Exeter City have signed free agents Jamie Cureton and Matt Oakley. City will not disclose how long their contracts are, but both have previously played for the St James Park club and have featured in pre-season matches. Oakley, a 34-year-old midfielder, left Leicester in May and played seven times on loan at Exeter. Striker Cureton, 36, spent part of the second half of last season on loan at St James Park and was released by Leyton Orient this summer. "I'm very happy because both players come in with a particular role in the team and we know them," manager Paul Tisdale told BBC Sport. "They fit the way we play and we suit them, and I think it's important that players are happy with their surroundings and these two will be more than happy here. "They'll add value and certainly make a big contribution to our team this year." It will be the third successive season at St James Park for Cureton. The former Reading, Bristol Rovers and Colchester frontman was top scorer at City two years ago and says he is capable of the same again this season. "I'd like to play as many games as possible and score as much as possible. "If I'm playing 40-plus games I'm expecting 20-plus goals and I'd like to get another promotion. "I've not scored in League Two, so if I score in League Two I'll have scored in every division and that's a bit of an ambition of mine." Oakley comes back to St James Park after making a good impact in his brief loan spell last season. He has recovered from a snapped tendon in his thigh and says Tisdale was one of the main reasons he decided to come back to Exeter. "He's a person I want to work for and a place I want to come and work at, it's as simple as that. "I just think he knows what he wants to get from his team, he gives them a structure. "He treats everyone on a level playing field and gives the team direction on how to win games. "I've played under some managers who didn't coach very well, didn't manage very well, but at this club everyone knows where they stand," Oakley added. And Tisdale says he doubts that there will be any more additions to his squad. "If Jamie and Matt hadn't wanted to sign I don't think I'd have chased anyone else. "It wasn't a case of me wanting another centre forward per se, I knew Jamie would suit us. "It's not always about filling positions, it's about the right type of people and Matt and Jamie complete our signings."